I am so honored to be part of the blog tour for Theresa Linden’s new adult novel, Anyone But Him. In one sentence, I can tell you that I LOVED this book! In a few more sentences, I will tell you why. The arrival of her first love, her husband’s younger brother, intent on helping her regain her memory, offers a glimmer of hope. Together they uncover secrets involving her coworkers and the local abortion clinic, but nothing to explain why she married this man. Who changed—him or her? Anyone But Him had me instantly captivated. Right from the beginning, it was a real page turner. I cannot imagine what it would be like to wake up one day and not remember marrying my husband. What would be worse is only recalling old, negative feelings I had for him. In this novel, Caitlyn feels this (and so much more) toward her husband Jarrett, and because of this, she is tempted to bolt many times. Who could blame her? But she doesn’t, because deep down, she believes in real love and real marriage. Somehow there has to be a reason why she chose him. Jarrett feels frustrated with the entire situation. Obviously, he loves Caitlyn, but sometimes he has an odd way of showing it. But at the same time, he shows an incredible amount of patience. He waits for her to rediscover her feelings for him, while not hiding his love and affection for her. As the story progresses, the reader discovers why these two are together in the first place, how they rekindle their love, and how nothing is impossible for God. In addition to the love story, which is incredibly clean and honors the Sacrament of Holy Matrimony, Anyone But Him is brimming with suspense and mystery. How did she end up with amnesia? On each page, more clues turn up, and the puzzle pieces start coming together. I couldn’t help but read “just one more page,” even when it got a little late at night! Lastly, Linden weaves the Catholic faith into the storyline beautifully, and moral topics, including abortion, are carefully and thoughtfully articulated. I highly recommend Anyone But Him by Theresa Linden! What excites me the most is that the characters in this book are part of her YA series about the West brothers, and now I get to go back and read their backstory. Theresa Linden is the author of award-winning Catholic teen fiction. Raised in a military family, she developed a strong patriotism and a sense of adventure. Her Catholic faith inspires the belief that there is no greater adventure than the reality we can’t see, the spiritual side of life. Theresa has six published novels, and two short stories in Image and Likeness: Literary Reflections on the Theology of the Body (Full Quiver Publishing). 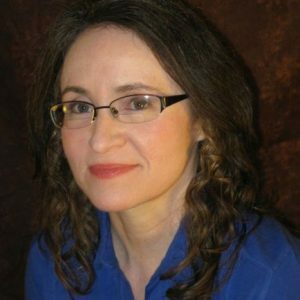 She holds a Catechetical Diploma from Catholic Distance University and is a member of the Catholic Writers Guild and the International Writers Society. A wife, homeschooling mom, and Secular Franciscan, she resides in northeast Ohio with her husband and three teenage boys. You can follow her on Facebook, Twitter, and Goodreads. To read more glowing reviews of Anyone But Him, please visit the other blog stops on this virtual book tour. You will find several reviews, a book trailer, a cooking video and printable recipe from the story, an author interview, and another chance to win a copy of the book! As part of the blog tour, I am happy to share that Theresa has generously offered to giveaway one signed copy of Anyone But Him to one of my readers! To enter the giveaway, please fill out the Rafflecopter form below. The book will be mailed to anyone living in the continental US. If someone outside of the US wins, an electronic version of the book will be awarded. Thank you so much for being part of this virtual book tour! I am excited to finally release this book, and I just love your review! I am excited to read this book! I have loved your other recommendations. The Tomb, and The Well and the other one in the series are some of my favorites. I also loved the Christmas one on Kindle that you recommended. I always love the books you recommend. Especially The Tomb and The Well. This one sounds great! This book sounds intriguing! My kids and are currently listening to Mr. Lemoncello’s Library and it is hilarious. I am totally looking forward to reading it. I’ve ready 3 of the first 4 and need to read Standing Strong yet before this one. When I read the description of the new book, my initial response was, “Anyone but him!” Then, I laughed because that is the title of her book! Lol! I literally just finished reading “The Muder of Roger Ackroyd” by Agatha Christie today. (Agatha Christ is one of my favorite authors!!!) 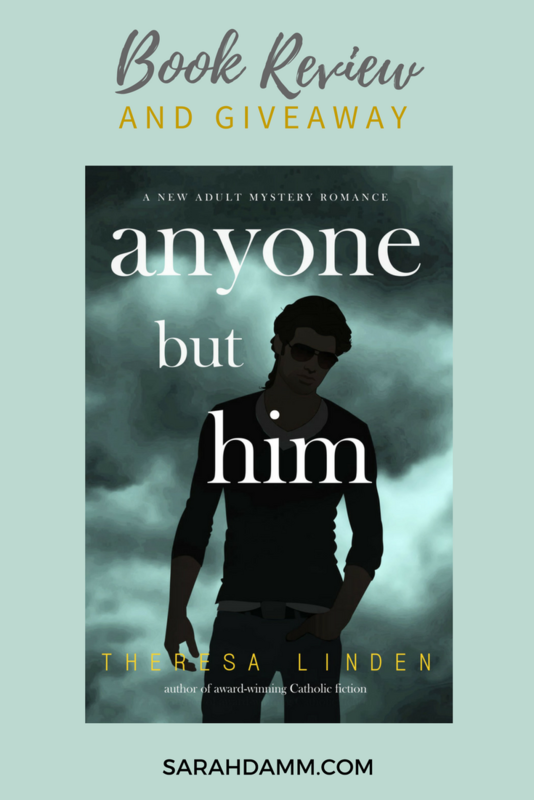 Now I am all ready to dive into Theresa Linden’s “Anyone But Him”!!! I loved Caitlyn from “Roland West Loner” and look forward to this book featuring her again and the intriguing mystery surrounding her is an exciting bonus! I am reading the ‘American Sisters’ series by Laurie Lawlor. I would like to read this book because it seems so interesting. I’ve read Theresa Lindens books and was excited to hear of this one available now. Always looking forward to her new books! This looks exciting. I’d have to catch up with the other books first though. Nicole, what is great is that “Anyone But Him” is a stand-alone book. You don’t have to read the YA series that these characters are in to read this one. I didn’t. But I liked these characters so much, I am excited to go back and read more about them. Currently reading War and Peace. =) I love Theresa Linden’s West Brothers series and am stoked for this one! This book sounds terrific! I like the fact it’s a YA book with a Catholic slant to it. Too many YA books leave out religion or are afraid to address it. I definitely will look into Theresa Linden’s earlier books. I’m reading Messenger, a graphic novel about Joan of Arc. Judy, this one is technically an adult novel, but her previous books are YA. All of them have a Catholic slant to them, which I agree is so needed in this day and age. I am currently reading, Sophie’s Heart, by Lori WIck another Christian romance writer that I love. I look for books that are clean and just like many other people, I like to read romance stories as well. I greatly look forward to reading Anyone But Him, as my interest was peeked by the description I read about a year before the book was released. It seemed like forever before it was finally out! Can’t wait to read it! I love Theresa Linden’ books! I would be a new reader for you but the storyline sounds fantastic. I enjoyed the review and introduction to Theresa.